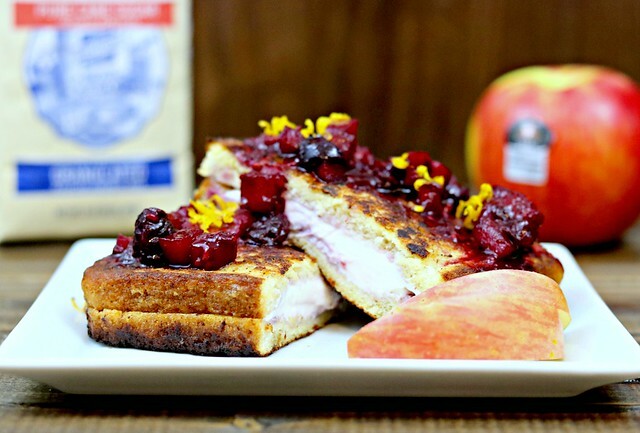 French toast gets a little touch of elegance and flair with this berry and cream cheese stuffed french toast with a citrus-apple-berry compote. Welcome to day 2 of #BrunchWeek! I hope you had a chance to check out yesterday’s posts from all the participants. There are some amazing recipes – so many I can’t wait to try! I remember having a stuffed French toast dish once a long time ago and being so stuffed afterwards that I don’t think I’ve eaten it since. Not because it was a bad experience, per se, but I just had it in my head that it was too filling to order at a restaurant, and perhaps more work than I cared to put in for a breakfast or brunch meal. And now, after making this French toast, I feel so silly. Because not only was it pretty simple, it was also delicious and not at all too filling or heavy. A big thanks to Dixie Crystals and Rainier Fruit for the amazing #sponsor gifts, that I was able to incorporate into this recipe. The sugar and apples were key components to this recipe!! And let me tell you guys…I’m typically a Granny Smith apple person. As in, I don’t buy any sort of red apple just to eat (but I will use them in recipes.) But these Lady Alice apples from Rainier were delicious. I could’ve eaten every single one of them in a day. But I spaced them out. And they were the perfect addition to the compote, since the berries were a little tart and the apples are on the sweeter side. And then that orange zest…mmm. I love me some citrus zest. Not to mention when you mix some of the compote juice in with the cream cheese for the filling. This French toast came together pretty easily, and not as heavy as traditional French toast. 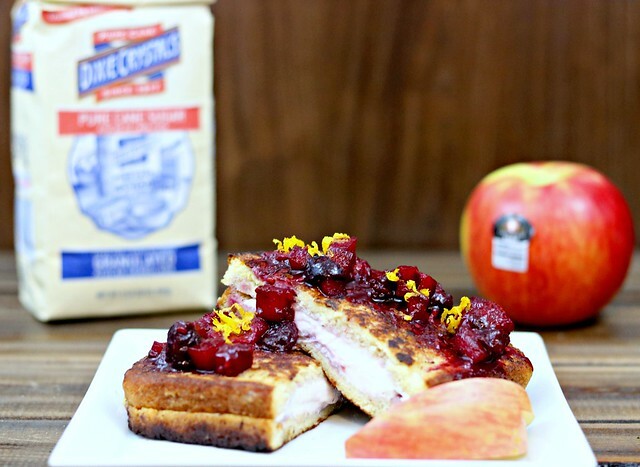 French toast gets a little bit of elegance and flair with this berry and cream cheese stuffed french toast with a citrus-apple-berry compote. Combine the apples, berries, sugar, orange zest and juice for the compote in a small saucepan. Stir to mix well and bring to a simmer. Let it cook down until the apples have started to soften, then remove the fruit with a slotted spoon to a bowl. Leave the juices in the pot and continue cooking at a steady simmer, until a syrupy sauce forms. This will take about 10 minutes. Allow to cool slightly. Place the softened cream cheese in a bowl and combine with a couple of tablespoons of the syrup, and set aside. Mix the remaining syrup with the fruit you set aside prior. In a shallow dish, combine the eggs, milk, orange juice and zest for the French toast, sugar, nutmeg, cinnamon and a pinch of salt. Whisk with a fork until well combined. 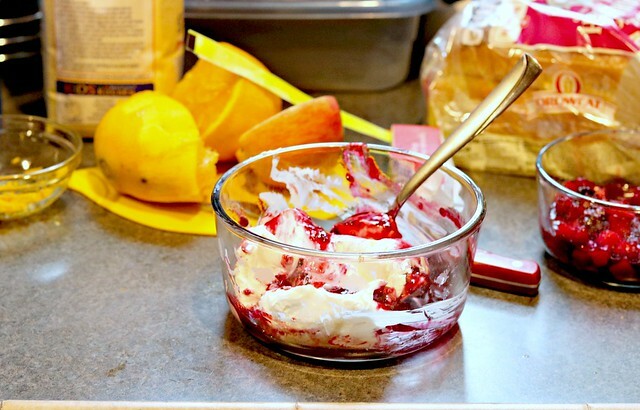 On four of your eight slices of bread, spoon a couple of tablespoons of the cream cheese and berry mixture and spread to about 1/4" from the edges. Top with the remaining slices of bread. Melt your butter in a skillet over medium heat, dip your stuffed French toast into the egg mixture - dip both sides - and place in the skillet. Do this in batches if necessary, adding more butter for each batch if needed. Cook each side until browned and crisp before turning and repeating on the other side. This can take 3-5 minutes per side, depending on your burner's temperature. Low and slow is better than fast and burnt with still-cold filling. Remove to a plate and top with the citrus-apple-berry compote! 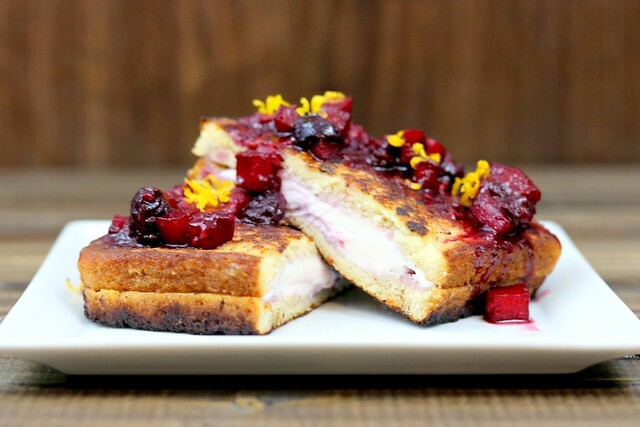 I have never had Stuffed French toast, this looks delicious! This sounds amazing! 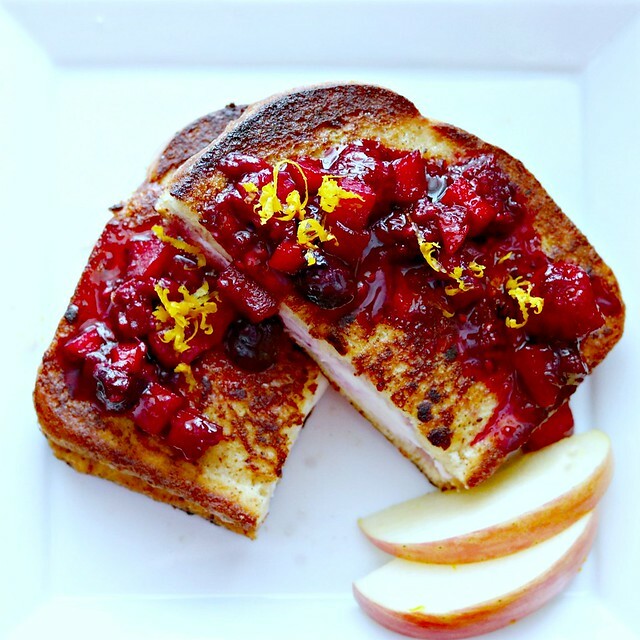 I love fruit with French toast and this compote sounds so delish! It really was quite amazing!! Hey very nice web site!! Man .. Beautiful .. Amazing .. I’ll bookmark your web site and take the feeds also…I am happy to find so many useful info here in the post, we need develop more techniques in this regard, thanks for sharing. . . . . . I don’t know if I’ve ever paired berries and apples in a dish and I’m wondering why ever not!? Gorgeous.